Lexus, Toyota’s luxury automobile division, has built and sold the IS series of sedans since 2006. The cars are manufactured in the Tahara plant in Aichi Prefecture, Japan, and for 2014 the model underwent an update in body styling, with the drive train carried over from 2013. For 2015, both the styling and drive train remained essentially unchanged. I recently tested a new 2015 Atomic Silver IS350, which was equipped with the 3.5-liter, 24-valve V-6 with 306 horsepower (6,400 rpm) and 277 lb.-ft. of torque. The sedan had a six-speed automatic with paddle shifters and a downshift rev-matching feature that worked like a charm. Acceleration was fine, and reportedly the Lexus ( this is the smallest sedan offering) will go zero to 60 in 5.6 seconds. Fuel economy ratings are 19 mpg in town, 26 mpg on the highway, with a 21 mpg overall rating and a 17.4 gallon fuel tank. The Lexus IS350 styling for 2015 has as its main calling card the new “spindle” grill found on their entire lineup in some form. The IS that I drove had black horizontal bars inserted in the grill along with dramatic inset LED daytime running lights and fog lights on the front of the car. The IS body styling features a scalloped crease that sweeps up just ahead of the rear wheel-well, and an integrated rear spoiler is molded onto the trailing edge of the trunk lid. The dark gray alloy wheels have ten spokes, and are fitted with Bridgestone 225/40R18 Turanza EL400’s, with all-season tread. Speaking of all seasons, the IS has a mode selector (on the console) that includes a snow setting for winter driving. For the other seasons, ECO, sport, and normal modes are on hand for a total of four settings. 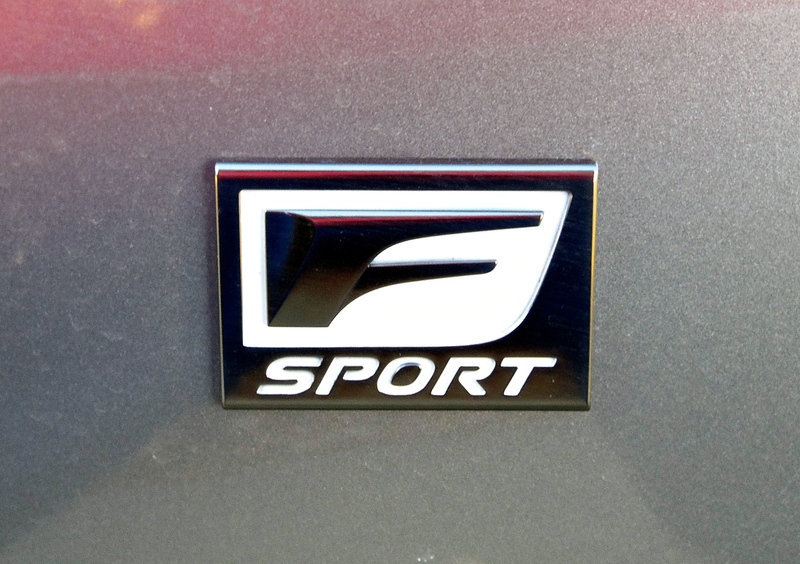 My Lexus was an F Sport iteration of the IS, which has more capable underpinnings for track-like performance. An exhilarating intake-noise sound generator kicked in when accelerating, so the car seemed more exciting than it actually might have been. It was enjoyable. Inside the new IS350, an additional measure of legroom has been added (about 1”, both front and rear), and the “mouse” has been retained on the console for controlling the infotainment system. The screen on the dashboard is 7”, measured diagonally. The IS features a moon roof, push button starter with proximity keyless entry, heated power leather bucket seats, 60/40 fold-down rear seat, ten airbags, Mark Levinson 16-speaker stereo, navigation system with rear facing camera, lane departure/blind spot/rear collision warning system, and power windows, locks, mirrors, with power tilt-telescope steering column. Seating is supportive and comfortable and the trunk can hold 13.8 cubic feet of cargo. M.S.R.P. 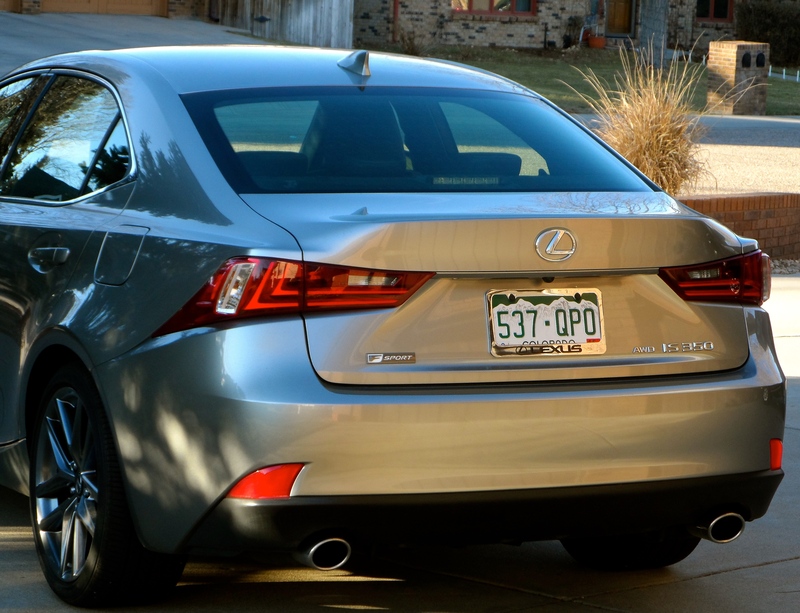 for the Lexus is $50,375.00, and that includes a base of $42,300.00 and options/freight totaling $8,075.00. 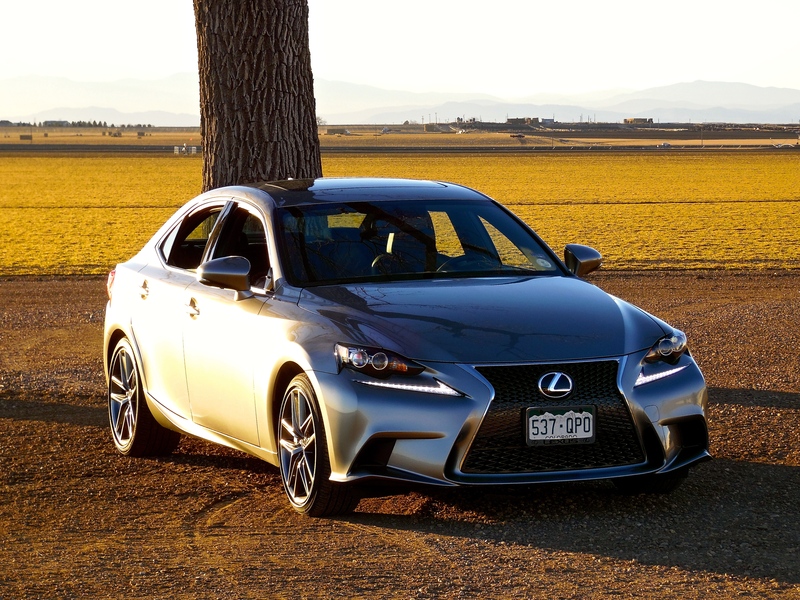 The IS350, a car that had prior to the 2014 model year become a bit marginalized, is currently front and center in the luxury sports sedan segment. Shoppers in that segment need to take a hard look at it. 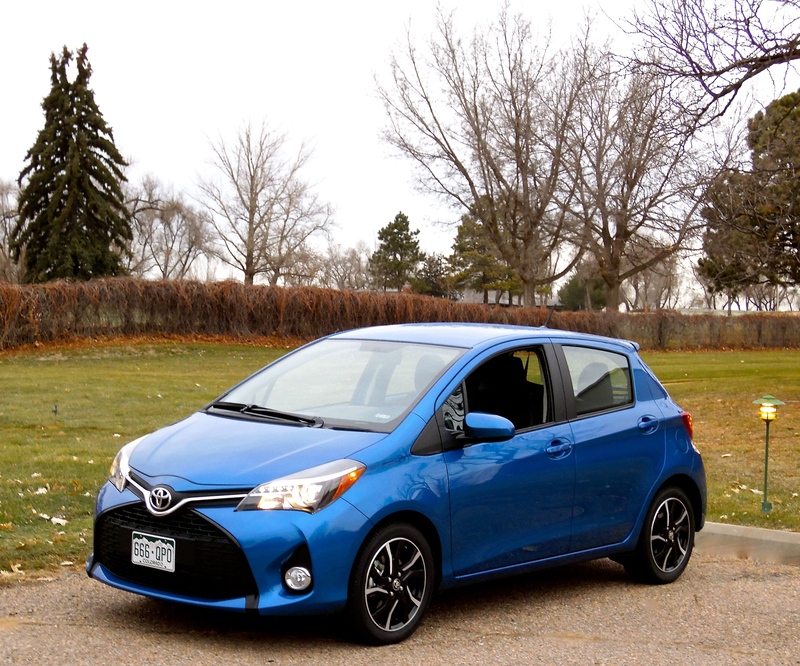 The most recent car brought to me for review earlier this week was the new 2015 Toyota Yaris . The model was the 5-door SE Liftback in Blue Streak metallic paint. And I like blue, particularly this shade – it was coupled with nice, black fabric seats, and black and silver-colored, 16″ alloy five-spoke wheels. The Yaris, which has been around since 2007, was substantially updated for the 2015 model and marketing of it started late last summer. A big change to the car involved production of it in France instead of in Japan. Styling is new in many respects, but drive train components are much like the 2014. The styling, by the way, is an improvement in my mind. The name of this car is derived from the word Charis, the Greek goddess of elegance and beauty. And the German expression of affirmation, “ya” is added onto the front of the name. It could just as surely refer to the target market of this car, Young Adults. On balance, it is a suitable name, and the Toyota people probably don’t mind that the word looks like the cultural epicenter of Europe, Paris (in France). Ruth and I jumped into the Yaris and drove to Cracker Barrel to get something to eat. Getting in the car wasn’t particularly difficult, and the highway manners were fine for a subcompact. The base price of the Yaris SE is 17,620.00, and the total M.S.R.P. is 18,625.00, including freight ($825.00) and carpeted floor and trunk mats ($180.00). Standard equipment on the Yaris included 4-speed automatic, front-wheel drive, real hand brake, electric power steering/windows/locks, color-keyed power mirrors, anti-lock braking system, air conditioning, remote keyless entry, CD/stereo with USB and aux. jack, tire pressure monitor, tilt wheel, and a 60/40 fold-down rear seat. Behind that last item is a 15.6 cu. ft. luggage compartment, with an articulating package tray above it. 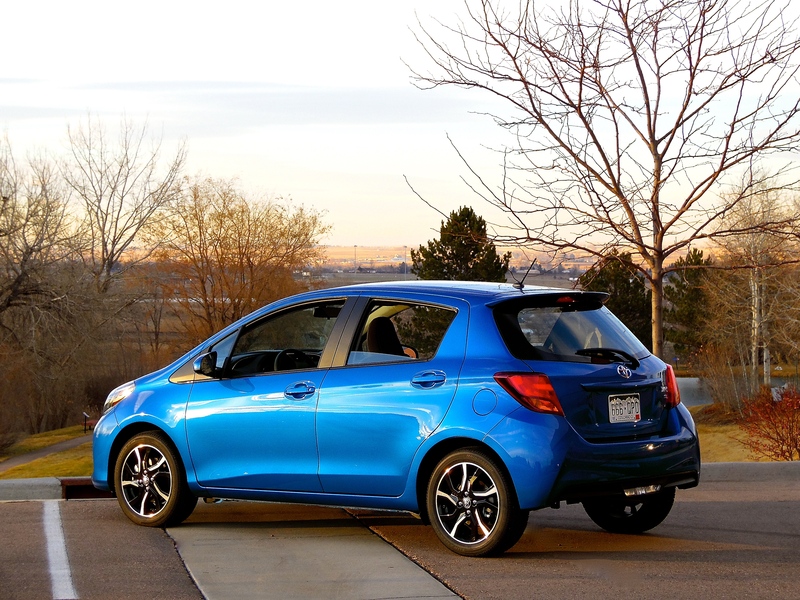 Dimensions associated with the Yaris SE are overall length of 154.7″, wheelbase of 98.8″, and curb weight of 2,315 lbs. The fuel tank holds 11.1 gallons of regular unleaded gasoline and the car seats five people. Yaris power is provided by a 1.5 liter, 4-cylinder, 106 hp (6,000 rpm) engine with variable valve timing. Torque is 103 lb. ft. (4,200 rpm), and acceleration is OK (zero to 60 in perhaps a touch under ten seconds.) Gas mileage ratings are 30 in town and 36 on the highway (an increase in highway mileage for 2015). I observed a reading of 32.5 overall. The car rides on P195/50R16 Bridgstone Turanza EL400 mud and snow radials. Turning circle of the Yaris is 36.1 feet. On this day the food in Loveland was good, and the ride back was a pleasure and I was proud to be seen in the Yaris. I guess I looked a little old, but Ruth didn’t. Would I let one of our three daughters drive, buy, ride in, lease, or borrow a Yaris? I sure would. Lexus’ big SUV with a truck frame underneath has been around since early in 1996 and the current offering was introduced as a 2008 model in eleven countries, including all of North America. The LX is a deluxe version of Toyota’s Land Cruiser, Lexus being the luxury division of Toyota Motor Company. 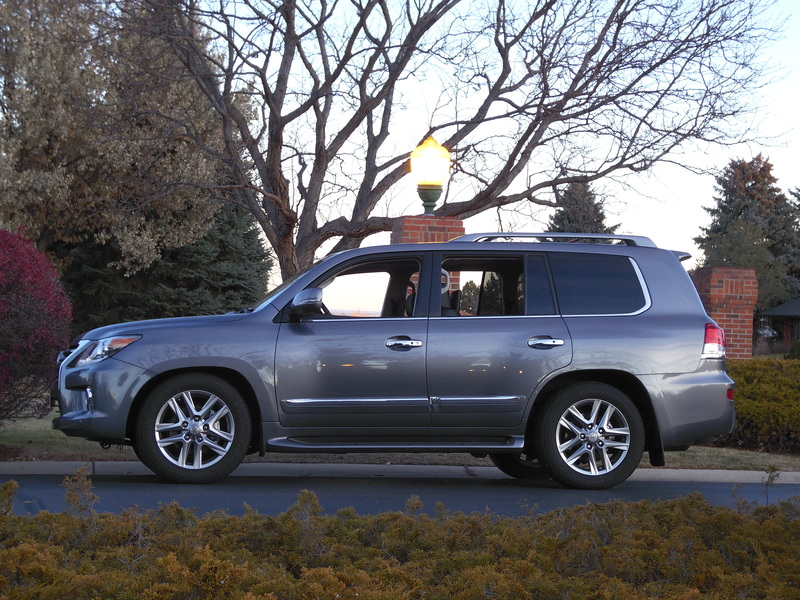 I was asked to test a 2015 Lexus LX570 recently, and it was the first time I entered or drove the big SUV. When I say big, I mean dimensions such as these; weight – 6,000 lbs., length – 197 “, height – 75.6″ wheelbase – 112.2″, towing capacity – 7,000 lbs. and passengers – eight. A Cadillac Escalade, for example, weighs 5,840 lbs. and is 116” long, seating seven passengers. They have similar M.S.R.P.s, that of the Lexus being $90,720.00. My test LX had a base price of $82,930.00 and added onto that was a luxury package ($1,510.00), Mark Levinson surround sound/DVD system ($2,350.00), intuitive park assist ($1,000.00), rear seat entertainment ($2,005.00), and a freight charge of $925.00. Power for the LX comes in the form of a 5.7 liter V-8 with 383 horsepower (5,600 rpm), and 403 lb. ft. of torque (3,600 rpm). Fuel economy ratings are 12 mpg for the city, 17 mpg for highway, and 14 mpg combined. The tank holds 24.8 gallons of premium unleaded fuel. Zero to 60 acceleration is reportedly 7.5 seconds and top track speed is 137 mph. A six-speed sequential-shift automatic transmission is on hand in the full-time four-wheel drive Lexus LX. 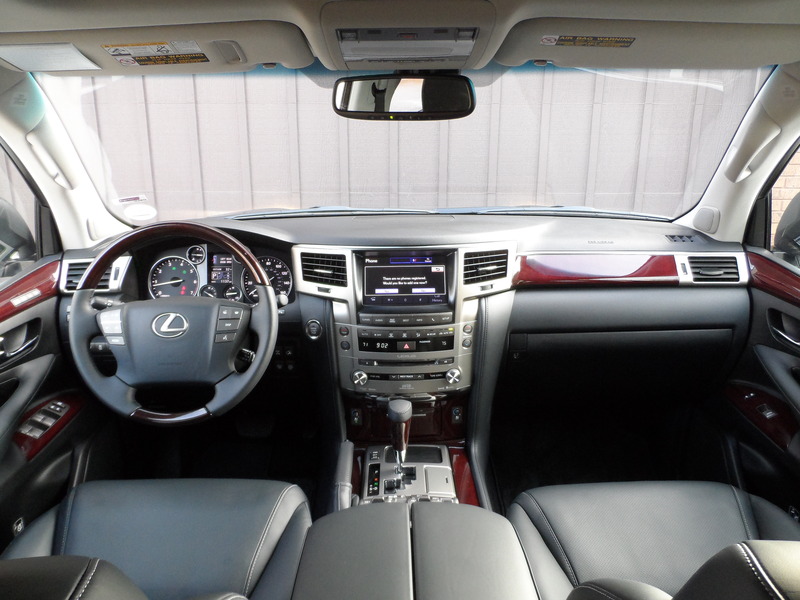 Inside the Lexus with its long equipment list are items such as semi-aniline leather upholstery, four heated and two air conditioned seats, heated steering wheel, a console cooler, and a Mark Levinson 19-speaker stereo system. Cameras are installed in the front, rear, and right-hand side of the Lexus for viewing on the dashboard infotainment screen. The interior is indeed sumptuous and quiet with tasteful woodgrain appointments seemingly everywhere near the driver. Styling of the LX is traditional Lexus with the big grill and windows, lighted side steps and concealed trailer hitch under the rear bumper. 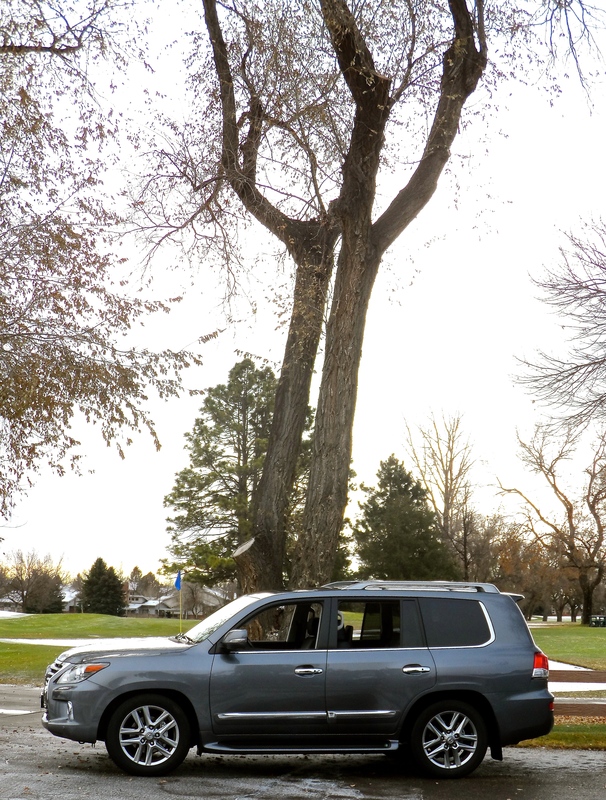 The paint was Nebula Gray Pearl metallic, giving the car an understated, formal attitude for driving around Greeley and parking at all the Black Friday shopping venues. Ten-spoke alloy wheels were on hand with 285/50R20 Dunlop PT2A GranTrek mud & snow radials wrapped around them. The power tailgate is a two-piece affair, and a spoiler and alloy luggage rack are installed. I went to Denver twice in big Lexus and it was a pleasure, including great visibility, handling, guidance, ride, and a lack of road noise. Shoppers in the luxury SUV segment need to consider the LX570 before making a purchase or lease decision.